Thanos is the greatest MCU villain, easy. We have reasons. The MCU's Mad Titan stands shoulder to shoulder with Ledger's Dark Knight and Star Wars Darth Vader. Thanos stands above them in new ways. I'm going to explore Thanos as a triumph of the MCU and examine what makes the character special. For fun, I've segmented out our discussion into...infinity stones. When I look at the MCU's greatest villain, I see six singularities, concentrated ingots that make up a great villain. I give you Thanos, the mad titan, the monolithic mega-villain of the massive MCU. Let's put Thanos into proper context before we start. Skip to the stones if you like. The Marvel Cinematic Universe accomplishes amazing cinematic feat after feat like the on-screen heroics of its superheroes. Yet for all 18 movies, they have yet to give fans a truly epic bad guy worthy of discussion among the great villains in cinema. The heroes are cinematic legend having completed three incredible trilogies so far for their biggest stars; Iron Man, Captain America, and Thor. The villains remain relegated to the shadows of these heroic movie titans. Great actors have played their villains well in the MCU, but none have clearly stood out. None of these movies suffer greatly from having a merely well done villain, but many were denied rarified air by lacking a GREAT villain. It’s been a common complaint for MCU detractors. It hasn’t been from lack of talent. From Jeff Bridges and Hugo Weaving up to Robert Redford and Cate Blanchett, all have served their heroes well enough. None have stood next to them and shined so brightly as the greats of the wider action and sci-fi genre. Darth Vader. The Joker. Gollum. The crowning villain of the superhero genre remains Heath Ledger’s Joker in The Dark Knight. He is and will continue to be the mark for all superhero movies. He has company on the Mount Rushmore of movie villains. Honestly, few films even attempt a great villain. They fall back on the much easier formula of focusing on the hero and providing a thin yet enjoyable and forgettable bad guy. It is the heroes movie after all. Forget about villains in big tentpole team up movies! Even a great movie like the first Avenger film is without a great villain. There simply isn’t enough time to develop a villain when you have a handful of major heroes to prioritize. But then again, the MCU bounds these obstacles like is has so many others on its way from sure to fail indy movie house to the greatest movie franchise EVER. Sorry, Star Wars - you know I'll always love you but a poorly done prequel trilogy and now a big misstep in your latest trilogy just got lapped by Cap and crew. And not just at the box office. On your left. You would be mad to bet against the movie titan that is now the MCU. The MCU created the modern blockbuster team up movie. Entering Avengers, ‘how could any film balance all these heroes?’ They made it look easy. And now, as the modern MCU comes to a “close” they have done it again, a movie great villain. 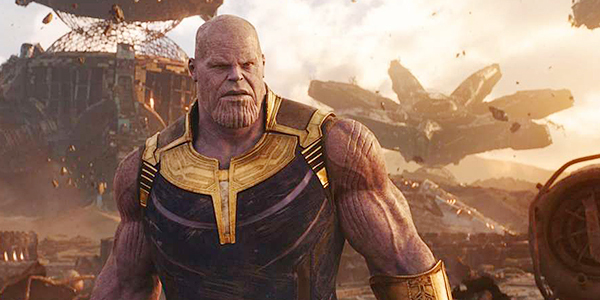 Infinity War gives the MCU its crowning achievement, a truly great villain that stands up to even the most enshrined movie bad guys...the Mad Titan, Thanos. Thanos comes in a different mold but he is as great as any we've seen on film. Thanos is now one of the greatest movie villains in movie history. If it isn’t obvious, I’m not talking drama comparing him to movies in other genres like The Godfather, Citizen Kane, or Casablanca. I'm talking action, sci-fi, superhero, fantasy, and the like. Get out your chisel and hammer because Thanos is going on the Mount Rushmore of greatest movie Villains right next to Darth Vader and The Joker. Let’s look deep into the Infinity Gauntlet and take a look at each of the infinity stones that make up Thanos as a great villain. Let’s look at reality here. The reality is that Avengers is a blockbuster team up movie. It’s a different animal than a solo hero expose like The Dark Knight and will have a different type of villain. The reality is that Thanos isn’t the opposition to a character like The Joker is for Batman. He isn’t chaos to order. Thanos is the villain to a team. He is the Avengers villain. Filmmakers have struggled greatly with this concept. It is an especially difficult problem to have. The antagonist for a whole group of heroes is complex. Matching one villain to a hero is difficult enough even when you have great source material...just ask BvS’s Lex Luthor. It’s no easy feat. To create an iconic villain in two and a half hours for a team of varying personalities, powers, abilities, motivations, etc… is near impossible. First, the reality of screen time is a huge factor. The MCU addressed this with “time” which we’ll discuss more in the Time Stone section. Heroes always outweigh your villain and having multiple heroes sharing screen time leaves little for the villain. That’s why Avengers plugged in Loki, who we already knew as stop gap to keep the movie moving so we can focus on our heroes. They could have done the Red Skull and had the same movie. That’s why movies like Justice League and even Avengers Age of Ultron struggled to get their villain off the ground. Time is big. Second, a great villain is the fire by which the hero is truly forged. How can this work with one villain and a team of very different characters? Movies have gone to the well of “take over the world” for team-up movie villains time after time. Ronan, Steppenwolf, Ultron, Enchantress, Loki, Apocalypse, Ego, etc… They all failed to even approach the top tier of villains, and many pulled their films down with the weight of their failure. The formula can produce a good movie, even a great one, but the villain won’t be enshrined along with the film. The reality is that we’ve spent 18 movies learning how powerful these heroes are and how many obstacles they can overcome. Thor is basically a god at this point in his own right. Hulk is near unstoppable, for all but Thor apparently. Cap and Iron Man can only be stopped by themselves and each other. Doctor Strange defeated Dormammu out of the gate. The Guardians of the Galaxy defeated a celestial god/planet in Ego. So, what can stand up to all of them combined? Can that even work on camera without seeming hokey and just goofy? Balance this with a level of intimacy a great villain requires to get the emotional investment of the audience and you begin to see why this hasn’t been done before. Lastly, it’s not like the MCU made it any easier on themselves. In addition to the massive power equation they have to rectify on screen with Thanos vs. a massive super-powered hero roster, they have been building him up for 6 years. He’s made several little yet important cameos in movies and end credit scenes. It’s not like they just said, ok - here is Thanos. The hype machine has been in full effect for over 10 movies and 6 years. Name another movie villain starting out under these circumstances, I couldn't. So, this is the reality Avengers Infinity War begins with and the massive difficulties Thanos has to stare down before he even steps into the light. It’s an equation weighted heavily to failure. We put the odds of successfully creating an epic villain at oh...14,000,605 to 1. The Avengers have evolved from two movies to five leading into the first Avenger film in 2012. Since then, they’ve added 12 more films leading into Avengers Infinity War. This is the big bang expansion era of the franchise. Many of these heroes have matured into massively powered forces of their own. Thor in his own right has been shown to have so much power in Thor Ragnarok he can fight off the Goddess of Death, an unleashed Hulk, a God named Surtur, and a giant dragon. Captain America went from super human to just plain super as he has gone toe to toe with Ultron, Iron Man, Spider-man, the Red Skull, and the Winter Soldier. Iron Man started off in a cave and has since developed an iron legion, a hulkbuster, a responsive suit, and now a nanotech armor that can do almost anything. We’ve watched for a decade as heroism has escalated brilliantly in the MCU. 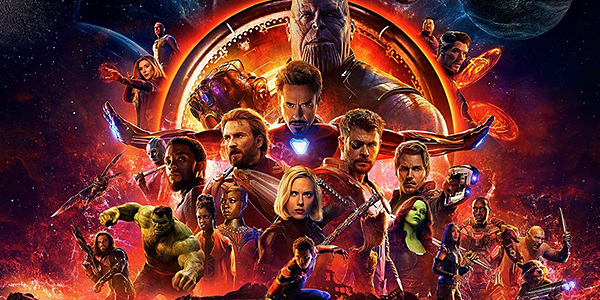 Leading into Avengers 3, it became clear that all of these heroes would be involved in the Infinity War as a true tribute to the great comic crossover events which form their inspiration. With this news, the equation changed from a handful of heroes vs. a villain or group of villains to a massive roster of heroes vs. an overpowered super duper villain. It’s all fine and good until you try and create a villain who can stand up to the combined might of these heroes and still make the conflict relatable. Past iterations of the Infinity War including the comics struggled with portraying this within a compelling narrative. Thanos wielding an Infinity Gauntlet was always too powerful. The Infinity Gauntlet and Infinity War comics both just brought in more powerful beings, celestials or characters like Adam Warlock. Watch the animated series version and you’ll see how linear it can be when the conflict is without compelling conflict. Despite these challenges, Thanos shines comes together powerfully. Thanos achieves a compelling conflict with our heroes while displaying unparalleled power on a cinematic scale we have never seen. Think of it if Star Wars went into Force Unleashed territory and a character pulled a star destroyer out of space with the Force. No one has dared go there cinematically and made it work. It’s impressive that they were able to show his power across nearly all spectrums so well and still make it feel real enough and compelling. Physically, Thanos and his Black Order overpower Thor and Heimdall off camera before the movie even starts, then Thanos takes down the Hulk with ease himself, and outwits Loki all within the opening scene ending the tricksters run as a god by choking him out. Thor makes a run at him and is swatted off like a child attacking a bear. From a pure energy standpoint, he uses the power and space stones to throw a moon at Iron Man and his team on Titan. He laters matches ability with Doctor Strange and Iron Man toe to toe with relative ease. Later, he brushes aside Avenger after Avenger as he seeks to acquire the final stone. And finally, he takes the best Thor can muster WITH his new god killing hammer Stormbreaker. Nothing can slow down Thanos. The beauty of the Thanos character is that he nearly loses, numerous times to the Avengers. Most notably, Tony’s team on Titan take him down with Mantis putting him into a trans-like sleep. The reason the Avengers and Guardians fail to win is not for lack of power. Thanos is outmatched time again physically though he recovers each time. Thanos struggles to fight the team on Titan. He doesn't make through the heroes in Wakanda in time to stop Wanda and Vision. He wins because his will never waivers. Collectively, the heroes don’t match the power of his will. Specifically, Star-Lord can’t make peace with the death of Gamora fast enough. Just an instant longer and Iron Man and Spidey have the gauntlet off and they've won. The beauty of the Thanos character is he displays the most power of any character to date on film and still manage to make him fallible. Seriously, tell me one character who matches throwing a moon at his foes. Sauron, nope. Vader, nope. The Joker, not that kind of villain. Lex, Doomsday, Apocalypse...I’ll wait. Thanos with his Infinity Gauntlet stand alone in power. Yet, even at these lofty heights. It is truly his will to act that is the difference between him and his foes. The level of character conflict in Infinity War is a big part of what make Thanos great. Infinity War does it masterfully with Thanos, despite going for the lofty heights they chased...and achieved. Thanos was afforded some luxuries that no other villain experienced. Each of these interesting unique elements take up space as both positive and negative, but can’t be overstated. No other villain has had a build up of 6 years and 13 movies. Each step along the MCU, whether Thanos or an Infinity Stone was present in the movie, the villain lurked over universe like a shadow. He was always coming. So much so that when Bruce Banner says Thanos is coming, the audience could scream out - finally, someone says it on screen! We’ve known this for the better part of a decade. No other character has had that kind of a build up for that long. The space Thanos took up entering into this movie was HUGE. In the end, it served as great hype as Infinity War was able to deliver a powerful and epic villain rather than wilt under the pressure. Time is the most important ingredient for a villain. Without it, the villain has to be extremely efficient as an element in a movie. This often proves a losing proposition. If a villain gets too much time, a hero suffers in quality and the film is all but doomed. The hero usually gets their time. The villain suffers. This is a big reason we see so many trilogies. Trilogies give the bigger stories more time to develop and much more time to be spent looking deeper into the antagonist. Even with all of the space the MCU gave Thanos coming in, the character still needed time. We knew very little of Thanos. This is where most villains fall far short. The Ronan's, Apocalypse’s, Steppenwolf’s, and so many more just aren’t given enough time to develop. Infinity War doesn’t make this mistake. But it isn’t because of Infinity War itself that Thanos is allowed the time to develop. The MCU is setting a different standard. With 18 movies to date over ten years, they have created a totally different equation than other films. The MCU can afford to give Thanos all the time he needed. They didn’t have to develop any heroes. They just had to touch on some of the development they already had in place for the few casual fans who had not seen any of these movies, if there is such a thing. The MCU patiently developed this massive unprecedented universe and one of the many amazing payoffs is in the storytelling they can do now. They can do things like spend time on developing a villain in their biggest movie because the audience is truly invested in their heroes. DC made this bet on their character's names and previous films. It didn’t pay off as they went for their big team up and were met with mediocre results. Marvel has taken its time. Thanos is their crowning achievement. It’s about time the MCU put up a noteworthy villain. In fact, it was time that made it all possible. You can’t have an all-time villain without really developing a strong and deep character; relatable, flawed, accessible, and dramatically heavy. To do this, Infinity War takes this ultimately powerful villain and gives him heart. We get a taste of this very early on when it is clear that Thanos understands that heart of a villain. He calls Loki’s bluff and extracts the Space stone from him. He knows that they aren’t heartless creatures, these villains. In fact, they are the opposite. This proves true for Thanos himself as he stands on the cliff of the Vormir with Gamora, his sacrifice. This scene is where Thanos went from compelling villain to potential great. He tosses Gamora, his favorite daughter, off the cliff in his biggest test of will. It steels his resolve. The level of intimacy with Thanos helps us access not only his motive and relate to his character, but it gives us a window into his heart. The surprise here is that Infinity War is able to accomplish this with a wholly CGI character. The performance of Josh Brolin is magically morphed into the purple, scarred face of the Mad Titan. And, we don’t lose anything from it dramatically. The weight of the character’s path and decisions still fall prominently on us as an audience and the story as a narrative. This is very rare. We can think of only Gollum who has had this effect among a host of others who have failed to maintain dramatic resonance while displaying the face of a visual effect instead of an actor. Steppenwolf failed, Doomsday failed, Ultron failed. Josh Brolin, the effects team, and Infinity War succeed in revealing the heart and soul of the villain. This wasn’t going to work if it was merely a power struggle, even if it was a compelling one. Thanos needed to display the intelligence and demeanor to match the Avengers. It’s Thanos’s mind that set him further apart from most other great villains and it gives us something very powerful to think about. Avengers 4 will no doubt, re-imagine this equation, but as it stands, Thanos won with a snap of his fingers. Darth Vader never won. In Empire Strikes Back, he was winning but he had not defeated Luke and the Jedi. Even at the end of Revenge of the Sith, Vader had not won. The Joker didn’t win. In The Dark Knight, Ledger’s Joker did much to test Batman, but in the end he loses the bet he places on his ace in the hole, Harvey. Batman’s will to win proves too much. Gollum lost along with Sauron. Even after The Two Towers, the villains were not winning let alone decisively. There was doubt in the narrative but never did the antagonists look like they won. Even the ring itself was belched into the fires of Mount Doom. Ultron never won. Lex, Enchantress, Apocalypse, Doomsday Steppenwolf all lose to their heroes. Hans Gruber took a dive out the window. The machines don’t defeat Neo. Voldemort doesn’t kill Harry Potter. Darth Vader doesn’t defeat the jedi. Magneto doesn’t get the best of Xavier and the X-men. None of these movies end with the villain on top, having accomplished his plan. Thanos ends the movie having erased half the MCU, sitting in a little mountainside hut seemingly retired from villainy. His plan worked. Thanos won. He beats them in every conceivable way. He overpowers the big ones, outsmarts the crafty ones, proved a strong will than the leaders, and took the biggest shots the best of them could muster. Then he kills half of them. Other great villains never ended a movie having killed off half our heroes. Think about it. We all know Avengers 4 will change things yet again. Black Panther will get another movie. Spider-man will too. So will Doctor Strange. The Guardians silliness will continue. Yet, they’re gone. Right now, in the MCU, half of all living beings are gone. That’s pretty powerful and this villain was able to accomplish that feat. Think about that. You get why Thanos ranks among the all-time great movie villains.